KayKiSpeaks.com: @KMichelle Just Said She's Gonna do WHAT to @ToyaWright?! @KMichelle Just Said She's Gonna do WHAT to @ToyaWright?! Anywho, after K Michelle's entire storyline so far on Atlanta's Love and Hip Hop has managed to be about her claims of abuse at the hand's of Toya's husband Memphitz, Toya has finally spoken out. K. Michelle made claims a long time ago that while she was in a relationship with Toya's husband that he abused her and then spent all of her budget money on Toya. Toya- had yet to really say anything in response until this past weekend when she attended blogger "Talking with Tami"s event. She felt it necessary to respond to the allegations and let the world know where she stands concerning them. This obviously didnt sit well with KMichelle who just took to her twitter page to threaten Toya. You can hear what Toya had to say and see what K. Michelle tweeted below, but come onnnnn K Michelle. Do you really honestly think it a possibility that this woman is going to let you make claims about her husband and not say anything? 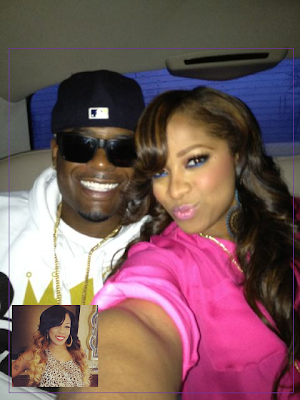 Does Toya not have the right to defend what she believes to be her man's character? Furthermore... why...in the world would you threaten to slap her?!???????? Ladies.. we gotta do better! For the record I am not saying Memph did or didnt do anything- I dont know and neither do you. What I AM saying is that if K Michelle has the right to speak her truth about Memphitz than SURELY his wife has the right to speak hers. u blog so much about toya. i always wonder if yall blogs get paid to kiss celebs asse. Anon shut the fuk up. I been reading this blog for 2 years and yes she used to blog a lot about Toya when she first started because she respected the celebrities in her city and who shared her blog posts. She has not hardly blogged anything about her in forever. Fall back. The word is asses by the way. This is hilarious!!! I knew ab the Memphitz thing & K. Michelle. I didn't know Toya commented and def didn't know K. Michelle did too.